In March 2017, a small salvage excavation was conducted at the western edge of Kafr Kanna (Permit No. A-7933; map. ref. 231614/739297; Fig. 1), following the exposure of ancient remains while laying infrastructures. 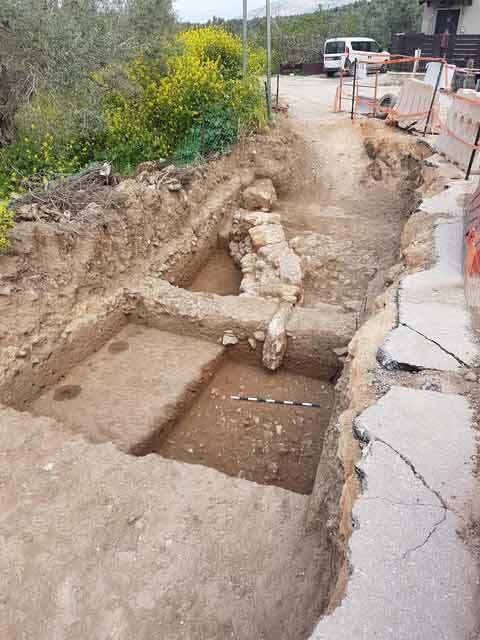 The excavation, on behalf of the Israel Antiquities Authority, was directed by Y. Alexandre (field photography), with the assistance of Y. Ya‘aqobi (administration), R. Liran (surveying and drafting), A. Shapiro (location map) and E. Delerzon (plan). The excavation (3 × 9 m) was located c. 500 m northwest of the Kanna spring, adjacent to a small southeast–northwest wadi along which the spring water flows to the northwest, toward the Bet Netofa valley. A segment of a large stone wall, probably from the Roman–Byzantine periods, was exposed (Figs. 2, 3); it may have been associated with water channeling, or alternatively, it may have bordered a road. 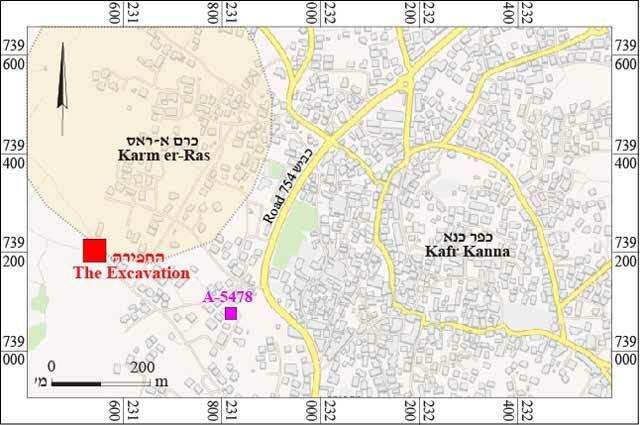 Many excavations conducted in the past have led to the understanding that there were settlements in different areas within the present-day village of Kafr Kanna in most periods. The Chalcolithic and Early Bronze Age settlements extended over a large area around the spring. Villages from the Iron Age and the Persian, Hellenistic, Roman and Byzantine periods were built on and around the hill of Karm er-Ras, c. 250 m north of the present excavation; in the Byzantine period, a synagogue stood in the old village nucleus. In the Mamluk and Ottoman periods, the village expanded over a wide area around the nucleus. In the immediate vicinity of the present excavation, c. 50 m south of the excavation area, several rock-hewn burial caves from the Roman period were revealed, including a burial cave that is traditionally identified as the tomb of Rabbi Simeon Ben Gamliel the Second, the head of the Sanhedrin in the Galilee in the second century CE (Alexandre 2015:153–154). These burials indicate that this area was exploited as a burial ground in the Roman period. 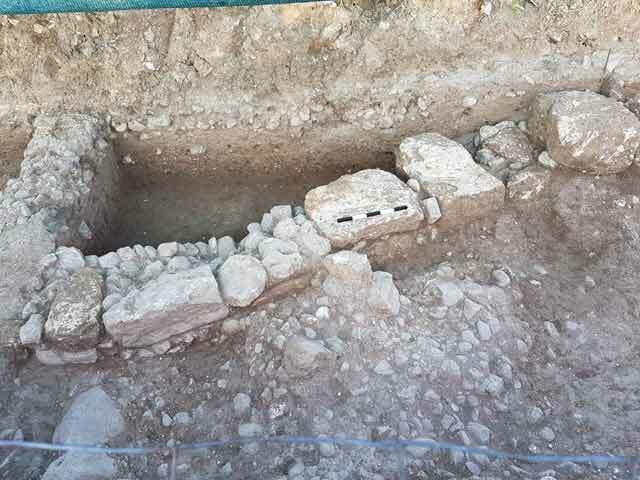 The excavation was confined to a small area due to existing infrastructures. A segment of a wall (W102; length 6 m, width 0.8 m, preserved height 0.7 m; Fig. 4) built of large, dressed limestone nari blocks, medium-sized fieldstones and small stones was exposed; it was built northwest–southeast and its course is not entirely straight. A floor of small stones (L104) abutted the eastern side of the wall. The pottery sherds on the floor and in the overlying soil accumulation were small body sherds, worn from water flow, but they were recognized as dating mostly to the Roman and Byzantine periods (second–sixth centuries CE; not illustrated) with a very few from the Middle Bronze Age, the Iron Age and the Hellenistic period. The relatively wide width of the wall and its construction—of a combination of large blocks and fieldstones—are not characteristic of Roman–Byzantine-period house walls. Considering the limited remains exposed, the orientation of the wall and its juxtaposition to the small wadi, it is possible that the wall may have been part of an installation that channeled water from the spring to the site of Karm er-Ras in the Roman period. However, no evidence of plaster was found and alternatively, the wall may have bordered a road or pathway. 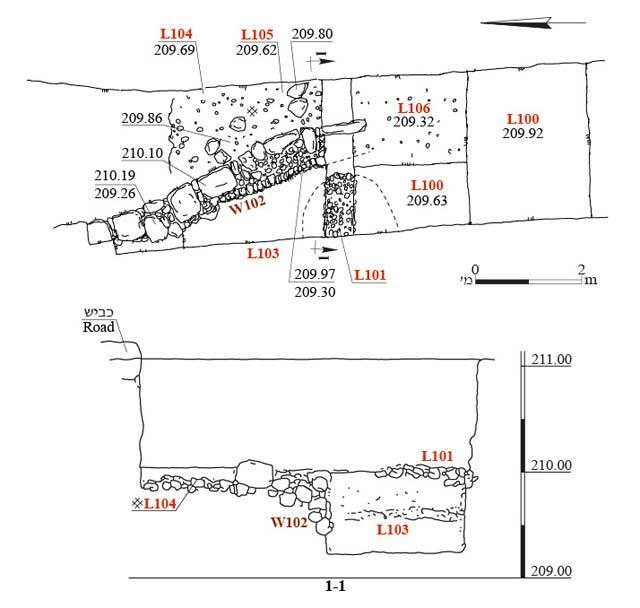 A road made of small stones delimited by two large walls was uncovered in a previous excavation in Kafr Kanna c. 300 m southeast of the present excavation (Alexandre 2009; Fig. 1: A-5478). Alexandre Y. 2009. Kafr Kanna. HA-ESI 121. Alexandre Y. 2015. Karm er-Ras near Kafr Kanna. In D.A. Fiensy and J.R. Riley eds. Galilee in the Late Second Temple and Mishnaic Periods 2. Minneapolis. Pp. 146–157. 3. The excavation, looking north. 4. Wall 102 and Floor 104, looking west.